The program’s mission is to “Develop Citizens of Character Dedicated to Serving Their Nation and Community”. In an effort to produce well-informed and helpful citizens, AFJROTC encourages its cadets to get involved in their local communities. This is one of the most interesting and fun aspects of the AFJROTC experience. 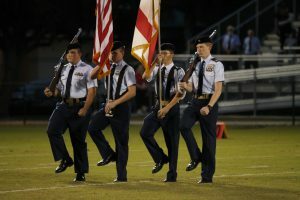 The cadets are given an opportunity to develop their leadership skills by organizing and structuring events, such as Honor Flight events, Color Guard Events, Fundraising events, and many others that include other parts of the community that we either help, or are being helped by. Some Units may organize POW/MIA ceremonies, parades, field trips, CAP flights, and various other activities. Any proceeds from these fund-raising activities benefit the respective units, or to charities they elect to support or sponsor. 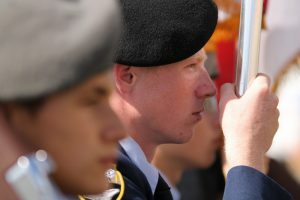 Students are also introduced to military customs and ceremonies, effective communications, management, human relations, and life after high school. All uniforms and curriculum materials are provided by the Air Force. The cadets will develop leadership qualities, and will learn how to work efficiently with others. 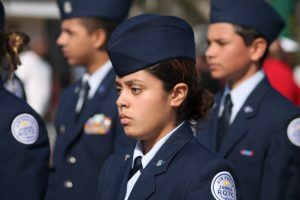 The AFJROTC program is not for recruiting, but for educating.